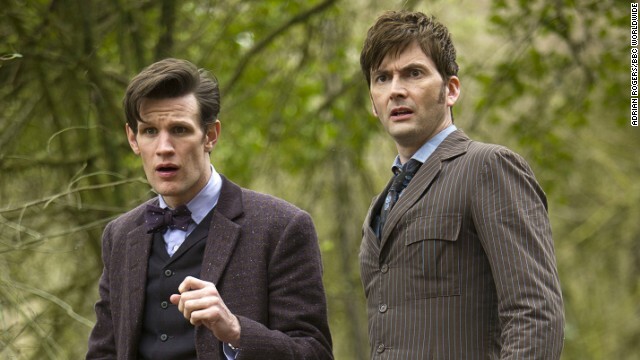 Saturday's much-anticipated 50th anniversary episode of "Doctor Who" is already a record breaker in more ways than one. The BBC America series is the longest running science fiction series in TV history, and on Sunday, Guinness World Records honored the show yet again with a world record for the largest ever simulcast of a TV drama. The episode - which was seen in 94 countries at the same time - featured the return of John Hurt's War Doctor, David Tennant's Tenth Doctor, and a couple of surprise cameos. There was Tom Baker (a.k.a. the much beloved Fourth Doctor) as a future incarnation of the Doctor and, in the biggest shock of all, Peter Capaldi as the Twelfth Doctor. Capaldi was not due to appear until Matt Smith's final episode on December 25, but in a show of strength, he joined 12 other versions of the Doctor in a big climactic moment (though we only saw his eyes). The 13 Doctors worked together to freeze their home planet of Gallifrey in a piece of art, meaning they did not have to make the decision of committing mass genocide to save the universe, a choice which has haunted the Doctor since the show rebooted in 2005. So between two cameos, a renumbering of the Doctors and a rewriting of the show's history, that was a lot for fans to take in. Social media lit up with excitement on Saturday over all of these developments and fans (or "Whovians") at a gathering in Atlanta shared their thoughts with CNN as well. Matthew Brewer of Fairburn, Georgia said, "They changed the past story of the bridging from classic to the current. I think it’s a good thing because now, technically, John Hurt’s Doctor being part of the Doctor line will play a part in the future." One actor who didn't appear, "Thor: The Dark World's" Christopher Eccleston, was a slight disappointment for Atlanta costume maker Sara Pope. "I was hoping for an Eccleston appearance but aside from that it met all my expectations and blew them out of the water. They had good chemistry and it was a lot of fun." James Panto admitted to mixed feelings about the episode. "There were things I absolutely loved about it and creative choices they made that I wasn’t anticipating," said the Flash animator from Marietta, Georgia. "Not to say it was terrible – it went in a direction I wouldn’t have gone. Overall, I definitely think it was very exciting and they’ve definitely done some interesting things to set up the future of the show. I’d like to have seen a little more love for the classic Doctors than they actually got." Fans will have a few weeks to let this episode simmer before the Christmas edition, in which Matt Smith says goodbye to the role he's been known for more than three years. I've never been able to see Dr. Who, simply because he is out of network. Great to see Tom Baker and hear the wonderful boom of his voice again in Doctor Who and for the sneak peek at the forthcoming Capaldi Doctor! There's a youtube clip going around of the apparent next 'regeneration' of The Master who will be facing off against Capaldi in the forthcoming series. According to several tweets by tweeter '@jamesstoker1963' The Master maybe returning for the Christmas episode and beyond. 'The Master DW2014' (Moff select final review clip). I don't know who the actor is but maybe they're going with an 'unknown' to play The Master after casting a 'known' actor in Peter Capaldi to play the 12th Doctor? I guess we'll find out soon enough"
Looks pretty cool for an audition clip and this 'Master' certainly has a creepy edge. Happy 50th Doctor Who and here's to the next 50! Tennant was the 12th doctor, not the 11th. Tennant was the 10th doctor. Capaldi will be the 12th-unless they are counting the warrior doctor played by John Hurt, then the numbers get all jumbled.